Wearing gas masks and ballistic ­armour, backed by fire crews and specially trained paramedics, officers from the Joint Counter Terrorism Team stormed three properties in Sydney’s west — at Sproule St, Lakemba, Renown Ave, Wiley Park, and Victoria Rd, Punchbowl — and a terrace on Goodlet Lne, Surry Hills, in the inner city. Prime Minister Malcolm Turnbull says the raids that took place on Saturday afternoon were designed to stop 'terrorist attacks in Australia'. He's been briefed on the operation by security agency heads and is expected to provide further details on later on this morning. Officers involved in the searches were looking for material that could be used to make an improvised explosive device or “some other method” to bring down a domestic passenger plane. “There was a threat of a device and an aircraft,” the official said, but added that its credibility was still being ­determined. Some media reports have claimed a suspicious device needed to be removed from the Surry Hills property. All airports in Australia are on heightened security and will continue until further notice. Wellcamp airport, taking produce direct to mainland China. The Toowoomba Chronicle can reveal Toowoomba and Surat Basin has entered into advanced talks with a Chinese company which has a close focus on the Darling Downs produce. TSBE executive chairman Shane Charles said the airline, which operates in the Chinese domestic market, was looking to "branch into international markets" with Toowoomba topping its list. "They have identified our region as a prime agricultural area," he said. "They are mostly interested in the freight products from Australia to mainland China." Mr Charles said TSBE had been in talks with the company and this week hosted a delegation with high-level management in Toowoomba. He said the company, whose name he would not reveal because of commercial confidentiality, was looking exclusively at Toowoomba and the Darling Downs. "They're concentrating on us first and have requested that (TSBE) give them assistance to talk to freight-forwarders in Australia, as well as potential suppliers. "They are looking to try and set up a service next year." If successful, the airline will be the second international freight service to export cargo and goods from Wellcamp airport following Cathay Pacific. Cathay Pacific previously flagged a possible expansion to its existing weekly freight service which takes Darling Downs produce from Wellcamp airport, after pick-ups in Sydney and Melbourne. Mr Charles said TSBE had played a key role in the negotiations with the second Chinese operator, with a delegation from the company due to return to Toowoomba in September. He said TSBE's Shanghai-based business development manager Wen Lui had been instrumental in early talks which had progressed to the advanced stages. "It's due to the relationship we have with China and the network we have set up," he said. "It's early days and this takes a lot of time. As mentioned in yesterdays blog I had to go to Melbourne for a night so I managed to grab a few photos this morning on my way in from a customer call plus aircraft overflying our office. It was time to head home and my Virgin flight VA 377 was leaving at 4pm and boarding was at 3.40 so I arrived at the airport around 2.50pm and spent 30 minutes doing some spotting with my little Pansonic pocket camera before heading off to the gate. We began boarding at 3.43 at gate 7 and I took my seat which was 20F. The last cabin door was closed at 4.00pm and we pushed back at 4.02pm. At 4.05 we began taxiing for runway 34, after arriving at the holding point we lined up straight away and got airborne at 4.11pm. Maintaining runway heading for a few miles we banked right and set course for Brisbane as we made our way to flight level 360. Our track took us in land west of Wagga Wagga and Orange. From Tamworth we flew towards the Gold Coast and then onto Brisbane following the coast line. The disappointment continued as we were offered one small lemon biscuit and a cup of tea. On the way up I watched another movie called "on the edge of 17" it was about a girl who's father died as she was about to turn 17 but she couldn't handled life and what it threw at her. It had both drama and romance. We began our descent in Brisbane at 5.35 and landed on runway 19 from the north at 6.05pm. Get your mind out of the gutter...its not what you think. Today I had to go to Melbourne once again just for the night so after flying QANTAS for years I thought I would break the mould and go Virgin Australia. A decision I now regret. My Virgin flight was to leave at 5.55am and boarding was to be at 5.25am so I set my alarm for 4am. Usual story, I was awake for about an hour and a half before hand. I got up at 3.45am and left home at 4am on the dot arriving at the airport car park at 4.35am. I went through security and after stopping for a few photos along the way I made my way to gate 44A where I was leaving from getting there around 4.55am. We began boarding flight VA304 at 5.27 and I took my seat which was 21F. The aircraft for today was VH-YIA (CN 37824) a Boeing 737-8FE. This the first time I have flown on this aircraft. The last cabin door was closed at 5.53 and we pushed back at 5.59am. At 6.04 we began taxiing out for runway 19 holding short of the runway at Alpha 3. We lined up and commenced rolling getting airborne at 6.12am. Doing the usual left and right banks after take off we set course for Melbourne. We were told prior to take off that due to strong headwinds our flying time would be 2 hours 25 minutes, 20 minutes more than usual. I decided to watch a movie so I chose Table 19; it was all set around a wedding and table 19 was were people they had to invited but didnt really want to sat. It had Anna Kendrick and Lisa Kudrow and it was a mixture or comedy and romance. I really enjoyed it. As we climbed to flight level 380 our track took us west of Beaudesert and over Tenterfeild, over the top of Gunnedah and on to Parkes. Flying Qantas I was used to getting a full breakfast either before hand or on board the aircraft. I didnt have breakfast because I expected it on the flight down. Well was I wrong... I got a baby choc chip muffin and a cup of tea. I asked if they were serving breakfast and I was told I could choose something for purchase from the menu in my seat pocket. Well it was rubbish... cheese and crakers and a beer; a chocolate biscuit and a hot chocolate was another choice and so on... nothing like a museli or yoghurt or even a hot meal of some sort.. I paid full price for my ticket and got nothing. As we commenced our descent at 8.02, we continued on tracking just east of Narrandera, at a place called Tolleen we banked left and made our way south flying past the airport and turning back and landing from the south on Runway 34 at 8.36am. 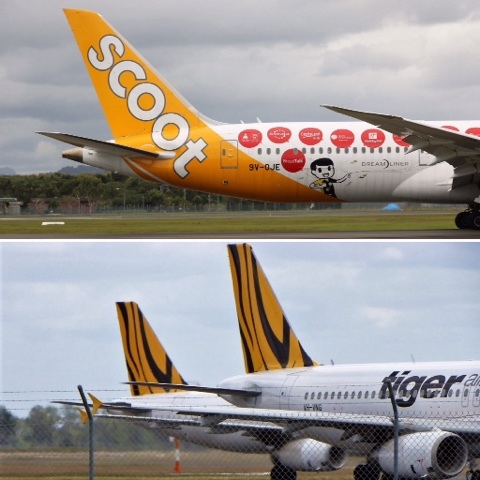 The Tigerair brand will be replaced with Scoot. Flight schedules (departure/arrival dates and times) will remain the same. Your Scoot flights will depart as scheduled, however instead of TZ, the designator code will be TR. With the merger, Scoot will operate two different fleets of Boeing 787 Dreamliner (existing Scoot fleet) and Airbus 320 (Tigerair fleet repainted into Scoot livery). Some of our networks will be served by both fleets. The Boeing 787 Dreamliner fleet will be indicated with either B787-9 or B787-8, and the 787 Dreamliner logo. The Scoot website, www.flyscoot.com is the sole booking platform for all flights operated by Scoot and Tigerair, and the Scoot call centre will also service bookings from both airlines. The existing Scoot-Tigerair check-in counters will also reflect a single Scoot brand. On Sunday 22nd July 1973, (44 years ago today) at 10:06pm local time a PanAm flight (PA816) from Auckland (AKL) to San Francisco (SFO) via Papeete (PPT) and Los Angeles (LAX) crashed into the ocean on take off from Tahiti airport.. The Boeing 707 named "Clipper Winged Racer" took off from runway 04 at Tahiti's Fa'a'ā International Airport for it's second leg of the flight. The airplane climbed to a height of 300 feet and initiated a left turn. 3 km (1.9 miles) NE of Papeete-Faaa Airport it began to descend with an excessive bank turn and struck the sea. The wreckage sank into the 2,300 foot (700 metres) deep waters. Miraculously out of the 69 passengers and 10 crew 1 person survived the crash. He was Neil Campbell, a Canadian citizen. PROBABLE CAUSE: All though the reason for the crash was never known, as both the CVR and FDR were never recovered. It is considered that an instrument failure may have diverted the crew's attention during the turn. It was dark outside and the turn was made towards the sea.